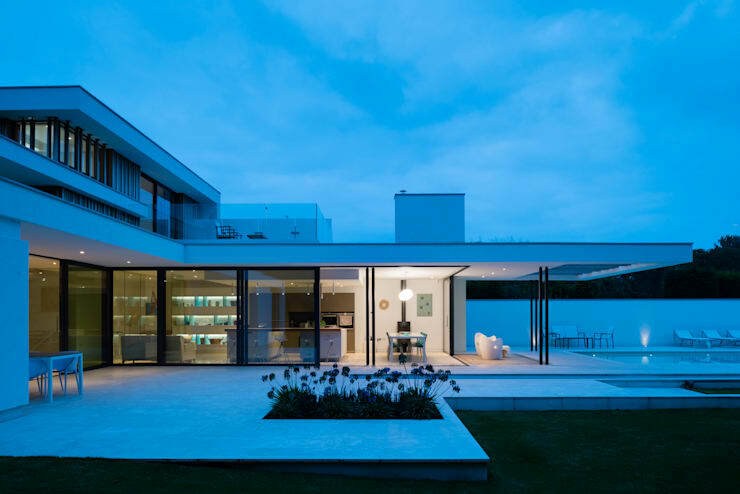 From the established architect firm, Selencky Parsons based in London, comes a most magnificent residence along the river Thames near Oxford, which is certain to astound all who has the pleasure to behold it. River House is definitely a victory for ultramodern architecture and design and will convince anyone of its reigning status. Bathed in the azure sky and bordering this well-known British body of water, a horizontal colossus seems to be effortlessly floating beside the river, level with the natural beauty of the even landscape. It is hard to think that this was a simple river bungalow in its previous incarnation! Why don't we take a walk around this impressive structure and see what's inside? The house from this point of view is undoubtedly impressive. The arresting, brilliant white of the concrete exterior breaks up the visual space in the environment, yet the reflective striking-blue pool, the abundant use of glass in the structure, and the integrated panes of wood take on the natural beauty of the ecological surroundings and integrates the house into the landscape. This balance between the integration with nature and a prominent, cloud-coloured structure seems to be ethereal and a display of ultimate grace. A passer-by might feel a moment's confusion and incredulity at the sight of the property, finding that they are still in Oxford and not at some otherworldly fortress. Coming up close and personal, we find the elongated, cantilevered canopy structure that seemingly goes on forever. A large concrete slab such as this can usually not defy gravity so gracefully, but the architects at Selencky Parsons certainly pull it off. The strong, angular lines and geometrical shapes of the building is softly counterbalanced by integrating wooden elements. The white, concrete porch that wraps around the house—although not in a traditional manner—flows right into the vivid green lawn, and obscures the definition of boundaries between the home and the landscape. What we find now is the entrance side of the house. The front door is neatly disguised amongst the timber planks that is prevalent in the façade. To reach the door, a short bridge has to be crossed over a breathtaking fountain and pool display, aptly lighted to blend into the blue overtones of the project. Besides the fascinating entrance to the house, what we see here is different horizontal and vertical levels created by the building materials. The use of the lively and light Iroko wood planks brings immense visual interest to the scene, and elongates the storeys. The horizontal concrete levels which break up the stretch of the timber, neatly structures the building into sensible spaces. The side view of the house in the lovely and gentle twilight will surely convince anyone of this home's glory, that is if any further conviction is even necessary! From this vantage point, the profile of the house can be seen at its best. 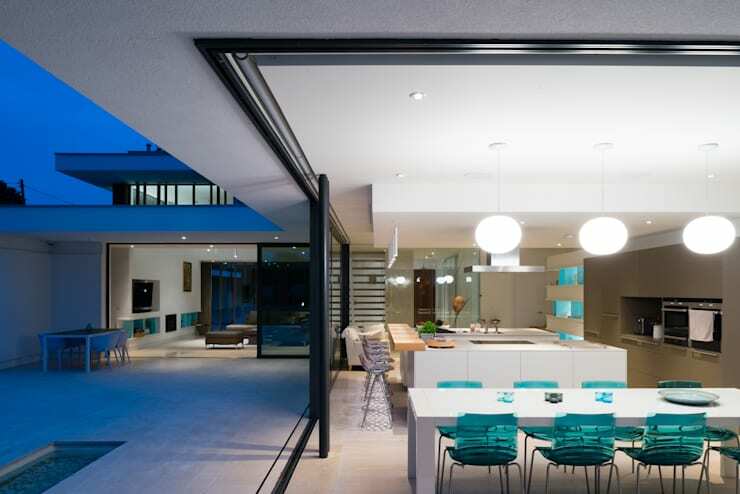 Large sliding glass door encircle the living areas, creating a buoyant openness. The large, Tetris-shaped patio holds a small pocket of Agapanthus flowers, creating a lovely central focal point in the space between indoors and out. This concentrated pouch of Lilies of the Nile (or rather of the Thames!) compensates for the lack of a floral presence in the rest of the garden area. If only one type of flowering plant was to be chosen for this space, it certainly cannot have been done better! Although there is an abundance of admirable aspects of the house's exterior, the interior offers its own bounty. We come into the living room through the expanse of left by the glass sliding door onto the patio. The opulence of space is immense, but not overwhelming. The clear, minimalist space decked in white, with the soft addition of the wooden elements visible through the window and in some pieces of furniture makes this room feel like a consecrated place. This revered feeling is promoted by the rhythm of the tubular lighting and the transparent glass wall dividing the living room form the hallway. The pure aesthetic of this room is bound to make all who enters it feel like they have found themselves in a sanctuary. The kitchen and dining room area is distinctively open-plan. 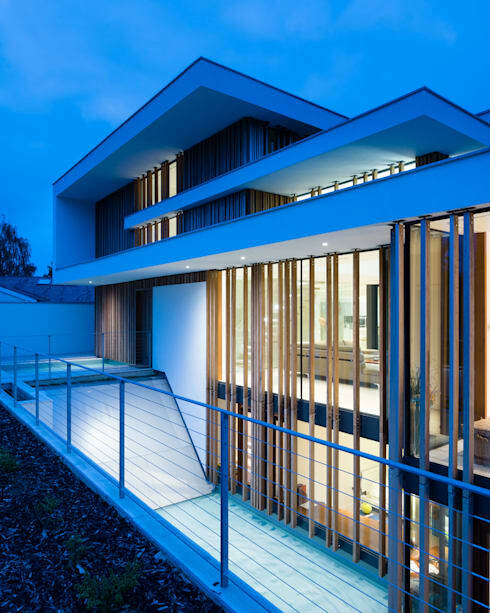 Not just in the sense of the use of space without division within a building, but it also incorporates the exterior of the house in its living space. The large sliding glass doors can be retracted nearly completely, exposing the kitchen/ dining area to the patio and beyond that, the lawn, the pool-side, the landscape, the river. 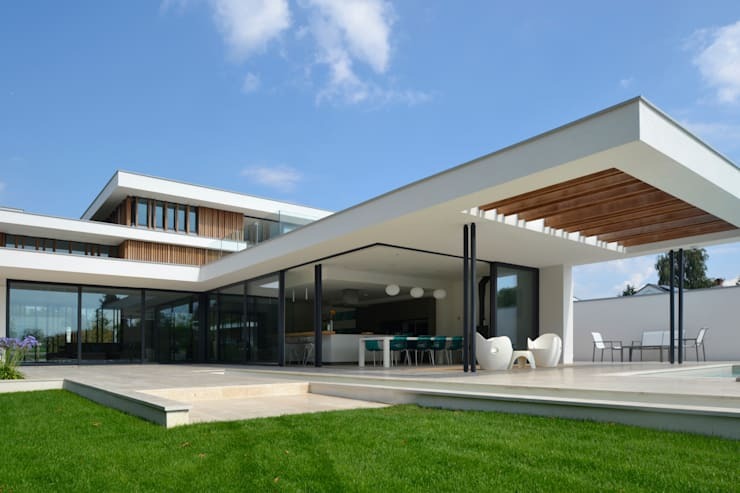 It perpetuates the endless setting created by the cantilevered canopy in the structure of the home. The enormity of the glass doors and the extent to which it opens is found in the living room as well. This has the effect that all of the living space can be opened simultaneously onto the patio, intermingling the boundaries of each respective space and making access to and from these room effortless. This brings us, at last, to the porch itself. Leading out from the dining area specifically, we find a veranda section, sheltered by the concrete canopy frame and timber beams which elongates the visible area. Just beyond this we see an extended an serene pool—very fitting to the house's theme. 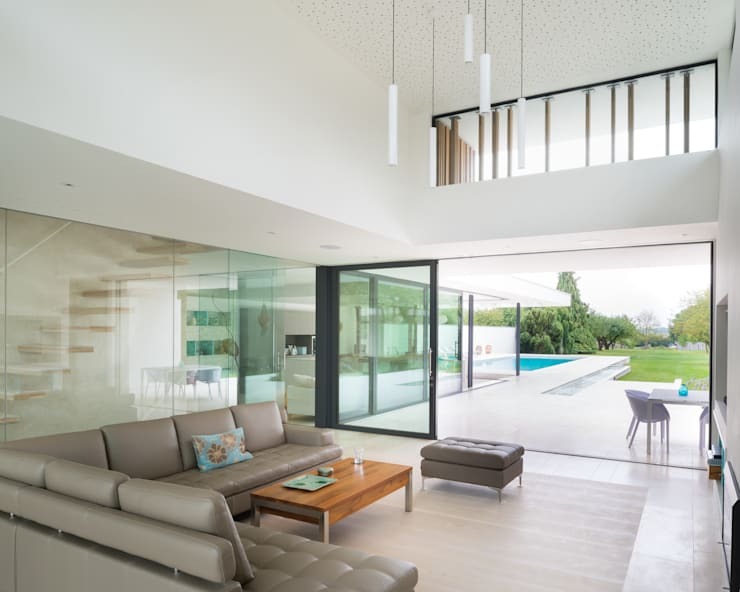 The connection between the interior and this outside area is nearly seamless. Not only do all the structure and forms of this building stretch even with the landscape for further than what is thought possible, the interior moves into the landscape itself with such little effort, that it may feel like living in an eternal retreat. If the effortless outdoor lifestyle of the River House is appealing, more ideas for sleek outdoor living spaces can be found in our Ideabook: 6 Sleek Outdoor Living Spaces. What do you think of the River House design? Be sure to let us know in the comments!